"I am an iPhone 7 user and want to know that how can I sync notes from iPhone to Mac? Do you have any suggestions? Thank you!" Notes usually come as the first method in our minds whenever we are in the need of jotting down something important. In this era of gadgets like iPhone, we seldom use pen or diary to write the first thing which comes into our mind whether it is a to-do list, a business plan or something else important. We just take out our iPhone from the pocket and start to note down that important list or any other thing. However, if you wish to use or edit those important notes on your Mac, you might be wondering how to get notes from iPhone to Mac. Therefore, we have come up with some easy and effective ways to sync notes from iPhone to Mac. Let us begin to know how to do it. 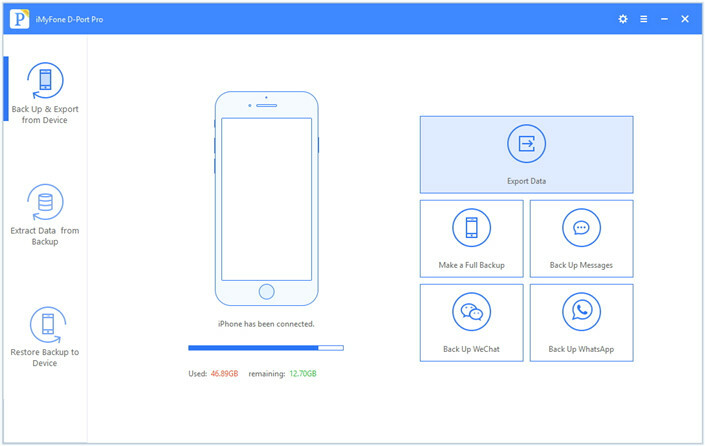 To learn how to sync notes from iPhone to Mac effectively, you need to try iMyFone D-Port Pro which is powerful and expert software that helps you backup and restore your iPhone and other iOS devices. This tool allows the users to backup and restore their data selectively or fully. It is also an extraction tool which allows you to extract 20+ types of data including notes from your iPhone to to your Mac. 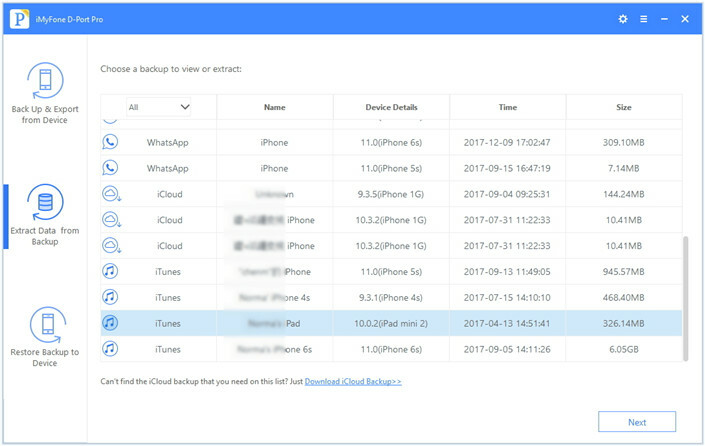 It can extract or export 20+ types of data from your iOS devices or backups like iTunes backup or iCloud backup. 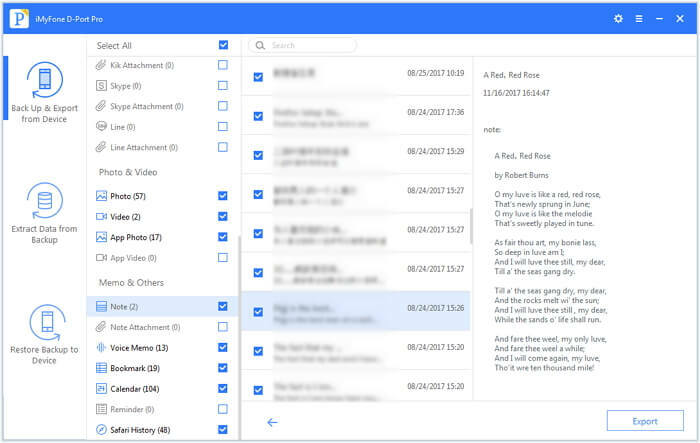 The software helps users in making separate backups of WhatsApp, WeChat or messages, and it will support more data for selective backup. You can also selectively restore your data from iTunes, iCloud or iMyFone backup. It works perfectly for all the iOS versions including iOS 11 and all the iOS devices including iPhone 8 and iPhone X. You can sync notes from iPhone to Mac by exporting the notes directly from your iPhone. This can be done very quickly and selectively. 1 – Launch the program in your PC and connect your iPhone to the PC. 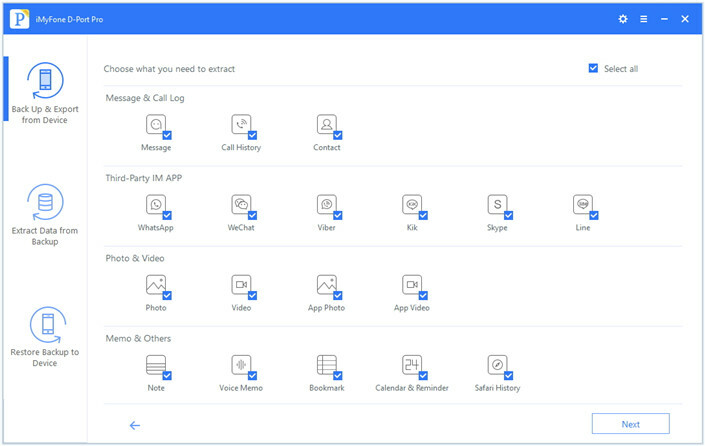 Now, click on "Back Up & Export from Device" on the main screen. Then click "Export Data". 2 –You will need to choose the data type that you want to export. Here you go with "Note". Click "Next" to proceed. 3 – The program will start to scan your device for notes. In the last, just choose the notes you want to sync to Mac and click "Export". You can select a fold on your Mac to store the notes. If you've backed up your notes to iTunes or iCloud and you want to extract them to your Mac, here are the easy steps you can follow to extract notes from iTunes backup. 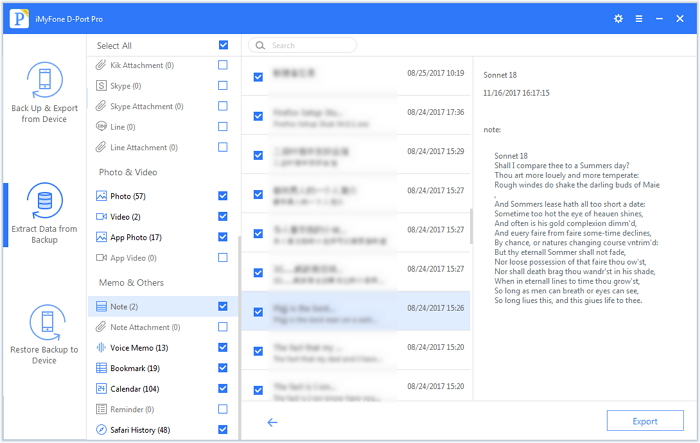 The steps are similar to extract notes from iCloud backup. 1 – Open iMyFone D-Port Pro and choose "Extract Data from Backup". This will bring a list of all the backups made by you. Choose one iTunes backup file and hit on the "Next" option. 2 – Now, select the types of data you want to extract. Click on "Notes" to extract only that. Once finished with selection, hit "Next". 3 – The backup will be scanned now. Preview them and choose what you want to sync to your Mac. click on "Extract" to finish the process. You can also sync your notes with the help of iCloud. This is another way to get your notes synced on Mac and you can carry them wherever you go. Here are the steps on how to sync notes from iPhone to Mac via iCloud. Please make sure that you have enabled Notes in iCloud settings on your iPhone. Step 1 – Open you Mac computer and launch "System Preferences" by clicking on Apple icon at the top left corner. 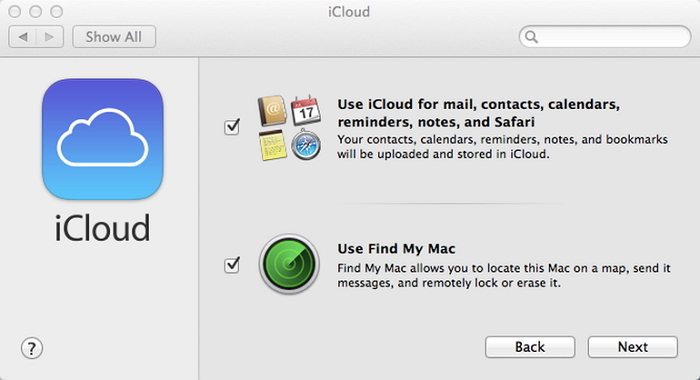 Step 2 – Look for the "iCloud" button and click on it. Step 3 – Now, sign in with your Apple details of ID and password. Enter the details and click on "Sign in" button. Step 4 – Next, you will need to click the box just beside "Use iCloud for mail, contacts, and calendars, reminders, notes and Safari" followed by clicking on"Next". This way your notes will be synced to Mac. Using email is another method to get notes from iPhone to Mac. Let us get to know the steps for this method of syncing. Presuming that you have setup an iCloud account on your iPhone already and your "Notes" is allowed to sync in your account settings, follow the steps below for syncing your notes from iPhone to Mac using email. Step 1 – On your Mac, hit on Apple logo at the top left and click on "System Preferences". Then tap on "Internet Accounts". Step 2 – From the upcoming list, select your email account provider and sign in to it using your Username and Password. Step 3 – Lastly, you have to choose the apps you wish to sync between the Mac and your email account. Hit on the checkbox next to "Notes" and tap "Done". That's it, in a while all your notes will be synced to your Mac. This is all we could get to you to make you understand how to sync notes from iPhone to Mac. Please let us know through the comments below what method you choose to get notes from iPhone to Mac and how it goes.